Oatmeal cookies are probably the illustrator's favorite. I have a recipe that I have used for years and really when you have something good, you don't mess with it. Years ago, I took a base recipe and tweaked it to suite the flavors that he really likes. He has been mentioning them for months now and I have put it off for fear that the gluten free version would never stand up to our tried and true version. The other problem is that I only buy gluten free oats from the natural food warehouse here because they are so expensive at the grocery store! So, a couple of weeks ago, I loaded up on gluten free oats just so I could make some cookies for him! I decided to take them one step further on the healthy scale. I had some coconut oil and decided that we would go that route this time. I have never baked cookies with coconut oil and I am very pleased with the results! I baked them off, made a cup of coffee and delivered a cookie to the illustrator for an afternoon pick me up. I was so happy...I got the thumbs up! They were perfect! Not only that, the little ones liked them and they were gone in no time. I love it when things work out like this! 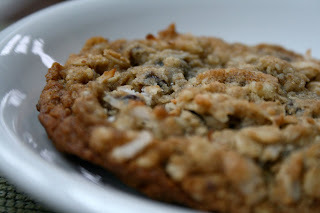 So, now I have our Gluten Free/Dairy Free Favorite Oatmeal Cookies! Preheat the oven to 350 degrees. Whisk together the flours, baking soda, and salt in a bowl and set aside. Cream together the coconut oil and sugars until light and fluffy. Beat in egg and vanilla, scraping down the sides of bowl as needed. Add the flour mixture to the sugar mixture and beat just until combined. Next stir in the oats, raisins, nuts/seeds and coconut just until combined. Drop level 1/4-cup measures of dough onto baking sheets (I use my ice cream scoop) lined with parchment paper about 1 1/2 inches apart. Press down a little so they bake into a nice round cookie. Bake until they are golden brown and soft to the touch about 18minutes, rotating the cookie sheet halfway through. Cool 5 minutes on the cookie sheets and then transfer to a wire rack to cool completely. You can make these smaller, just cut back on the baking time. 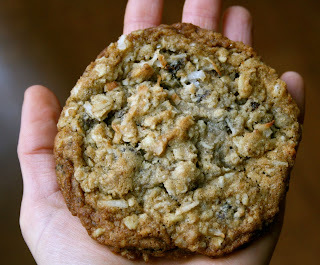 The size I make them, makes them more like a granola bar...but a cookie! Tip: To keep chewy cookies fresh, put a few mini marshmallows in the tupperware with the cookies. The take the moisture from the marshmallows. Thanks for the recipe! These looks incredible! Thanks Estela, I hope you like them! Danielle, I got mine from the international food market. So much cheaper! Nom - I am def making those cookies! I love your blog, especially as I am also Lactose intolerant, and will visit frequently! 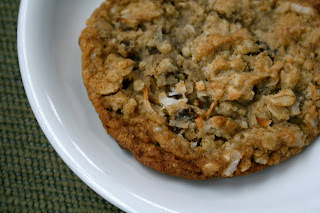 i just made a batch of these cookies and there are wonderful! :) So glad I randomly came across this recipe. Thanks! I don't know if this will get answered for me tonight or not because this is almost 1 year later. I see that twice the plural for egg is used yet the recipe only calls for 1 egg(s). Is it 1 egg or 2 eggs? Thanks! Beth, sorry about that. It is one egg. I fixed it.